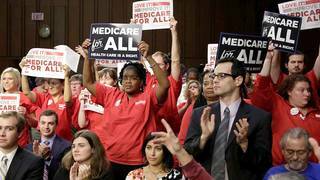 Newly Formed 150,000-Strong Nurses’ Union Pushes for Single-Payer Healthcare | Democracy Now! Registered nurse and the co-president of the California Nurses Association/National Nurses Organizing Committee. AMY GOODMAN: The Senate Finance Committee held the first of many hearings on President Obama’s multibillion-dollar plans for healthcare reform yesterday. Peter Orszag, Obama’s budget director, was the only witness called. He testified at the beginning of the session that he would not be able to provide details on the administration’s plans for healthcare but that all options are on the table. PETER ORSZAG: Let me just note immediately, so that perhaps we can avoid the typical Washington game of “gotcha,” that the administration has been very clear that we want a — we put a significant down payment on the table, but with regard to benefits and coverage, we want to leave everything on the table at this point to allow the process to play out, so you should not expect and you will not be receiving definitive answers from me on exactly what the administration does or does not favor on the benefits and coverage side of health reform. Meanwhile, single-payer solutions get almost no space in the debate. A study has just been released by the media watch group Fairness and Accuracy in Reporting. It found that in the week before Obama’s healthcare summit last week, of the hundreds of stories that appeared in major newspapers and on the networks, “only five included the views of advocates of single-payer — none of which appeared on television.” Most opinion columns that mentioned single payer were written by opponents. At the healthcare summit itself, initially not a single advocate for single-payer healthcare was invited. Congress member John Conyers is the sponsor HR 676, legislation that seeks to create a single-payer program. But when Conyers directly asked President Obama at a Congressional Black Caucus meeting if he could attend the summit, he was not immediately invited. Conyers had asked to bring Dr. Marcia Angell, the first woman editor-in-chief of The New England Journal of Medicine, the most prestigious medical journal in the country, and he asked to bring Dr. Quentin Young, perhaps the most well-known single-payer advocate in America. Dr. Young was Reverend Martin Luther King, Jr.’s doctor when King lived in Chicago. But he came to know Barack Obama even better. Though his medical partner was Obama’s doctor, Dr. Young was his neighbor, friend and ally for decades. After much outcry, Conyers was invited, along with Oliver Fein, president of Physicians for a National Health Program. Dr. Young was not invited. Well, today, Dr. Quentin Young has been invited to join us from a studio in Chicago. We’re also joined by two other advocates of single-payer healthcare. Geri Jenkins is a registered nurse and the co-president of the California Nurses Association/National Nurses Organizing Committee, a newly formed union that’s America’s largest nurses’ union, the fastest-growing union of any kind. She joins us from Washington, D.C., as does Russell Mokhiber. He’s the editor of the Corporate Crime Reporter. He has just started a new group called Single Payer Action. He’s going to the national meeting of the American Health Insurance Plans today in D.C. and is joining others in burning their health insurance bills outside in protest. We welcome you all to Democracy Now! Geri Jenkins, let’s begin with you. First of all, tell us about your new union of 150,000 registered nurses and why single payer is your critical issue. GERI JENKINS: Well, we formed a group with the United American Nurses and the Massachusetts State Nurses, which is now 150,000 registered nurses, which is actually ten percent of all the hospital-based nurses in the country. And we’ve done this because we really think nurses have a vital voice in defining how healthcare is delivered in this country. We are the first line of defense for patients. We’re at the bedside twenty-four hours, seven days a week. And we have, as a primary role as nurses, to be the patient advocate. So we see, up close and personal, every day in our jobs what the current system of healthcare has done to people’s lives. And so, we feel very strongly that, as a group of 150,000 nurses, that this gives us the ability to go out and advocate in a much stronger way for what we know is in the best interest of our patients and the public, which we believe is a single-payer healthcare plan. AMY GOODMAN: What do you mean by “single-payer,” Geri Jenkins? GERI JENKINS: Well, support John Conyers’s bill, HR 676, which would be publicly funded but privately administered, which means you would have complete choice in your doctors and your hospitals and where you go. It’s basically an expansion of Medicare that would cover everyone. And we would really like to push to have an honest, open debate on how single-payer healthcare fits into the whole health reform issues that are being discussed here in Washington, because the way it is right now, as you said, it’s pretty much been taken off the table. And we really think if we could get the Congressional Budget Office to cost it out, compare it to these other programs, it’s pretty obvious it’s the most cost-effective, efficient way to deliver healthcare. It creates a uniform single standard of care, quality care, for everyone. And we really think it is the best option out there. But as you said, it’s pretty much not being discussed. So we really feel strongly that this is the answer. AMY GOODMAN: Geri Jenkins, we have to break, but we’ll come back to Russell Mokhiber of Corporate Crime Reporter and Single Payer Action, as well as Dr. Quentin Young, in a minute. AMY GOODMAN: As we talk about the issue of single payer, what the media almost discusses not at all, not to mention the administration or what’s being considered on Capitol Hill right now, our guests are Russell Mokhiber, who is just starting Single Payer Action, and Geri Jenkins. They’re both in Washington, D.C. In a minute, we’ll be joined by Dr. Quentin Young in Chicago. Geri Jenkins has just begun the largest nurses’ union in the country. She’s a registered nurse and co-president of the California Nurses Association/National Nurses Organizing Committee. I wanted to play for you a commercial. This is a commercial for HR 676. HR 676 AD: What if we can save jobs and save lives? Single Payer/Medicare for All, HR 676, would create 2.6 million new jobs and guarantee healthcare for all Americans, with coverage that allows you to choose your own doctor and never lose benefits, even if you move or lose your job. Single-payer healthcare, an American dream for everyone. AMY GOODMAN: Geri Jenkins, this is your advertisement? GERI JENKINS: Yes, it is. AMY GOODMAN: Where is it playing? GERI JENKINS: I’m not real sure right now where it’s playing, but I think that one of the things that that advertisement points out that is being overlooked, as well, is the fact that converting to a single-payer system is a huge economic stimulus for the economy. Our research arm did a study, and it’s pretty amazing what it turned up in that study, because not only does it create 2.9 really good — 2.6 million good solid jobs that are American jobs that can’t be outsourced, you know, that are here in this country, it would also save huge amounts of money, and it would stimulate the economy to the tune of $300 billion that gets put back into the system through converting to this kind of healthcare. It’s the first study that’s looked at the ripple effect. You know, everyone talks about how much we spend on healthcare, but they don’t look at how much that healthcare generates in other jobs and industry that feeds into the system. So it could create a huge economic stimulus, in and of itself. So that’s the other side of it. In terms of the cost-effectiveness and the ability to provide a product that’s way better than what we provide now through the private insurance industry and employ people, it’s a huge boon to the economy, as well. So we think it’s really a shame that this isn’t being discussed further. And like I say, I’ve been up here in Washington going around with some groups of people talking to some legislators and their aides, and the Congressional Business Office isn’t — Budget Office isn’t even costing it out to what it would cost in comparison to these other plans, which is really interesting, because I think if they did that, they would find it’s pretty glaringly obvious what the most cost-effective plan is and the plan that would provide the best optimal care for people at the best cost. So it’s really interesting. AMY GOODMAN: Geri Jenkins, last September, a thousand nurses symbolically bridged the healthcare gap by marching across San Francisco’s Golden Gate Bridge. The nurses were calling for single-payer healthcare. One of the speakers was Hilda Sarkisyan. Her daughter Nataline died after she was denied a liver transplant by CIGNA Health. HILDA SARKISYAN: I want the whole world to know that we have a broken healthcare system. I’m a mother that’s gone through so much, and a lot of moms are going through the same thing that I have gone through. And we need to stop this, and we need to stop this now. If our government can have an emergency meeting to bail out, $700 billion, they can always have a meeting, a ten-minute meeting, for healthcare. This is so important for all of us. I wish I could go there and then face them eye to eye and tell them, “Only if you would do it, only if it’s your own child,” because they don’t care. They’re getting paid every month. They’re getting paid on time. They’re cutting our healthcare so the CEO will enjoy his life or her life. This is not right, you guys. We’re going to fight for all of us, for my daughter Nataline. She’s been with me. She’s being with me. She was with me last night. She came in my dream as a baby. And I know she’s telling me, “Go, Mom! Go get them!” And I’m going to do it. The insurance company can’t decide who’s going to live and who’s going to die. Only doctors and nurses. Thank you. AMY GOODMAN: Geri Jenkins, you are going to be holding a news conference today on Capitol Hill, an introduction of a new bill to guarantee comprehensive, quality, cost-effective healthcare for all Californians, as you’re putting it at the news conference today. Can you explain what this is? GERI JENKINS: Well, in California, we have actually gotten a single-payer bill through the state legislature on two occasions, and on two occasions Arnold Schwarzenegger vetoed it. So we are reintroducing our bill in California today. It was SB 840; the new number is SB 810. It’s being introduced by Mark Leno. And we really feel that with a new — a change of governor in California, that we could vote in single payer in California. We’ve proven it can get through the legislature, not once, but twice. So we think that’s a significant moment. And I was involved in the Nataline thing from the very beginning. And I was there at CIGNA when we finally pushed them — unfortunately, too late — to provide a transplant for Nataline. And it’s just really atrocious that we let decisions be made based on money and not on human life and what’s necessary to keep people alive. The Sarkisyans had insurance. And that’s the telling thing here. They had insurance. They had done everything that was expected of them. They worked hard. They provided insurance. And yet, when they needed it, it wasn’t there for them. And I think that’s really telling, because the insurance industry is here in Washington this week having their big confab, and as we read in the Washington Post last week, they’re spreading a lot of money around to keep people in the legislature trying to influence the debate to deflect away from their role in undermining the quality of care in this country by sucking a third of the money out and putting it into profits and overhead and CEO’s wages, as opposed to focusing the debate on what’s really going to be effective in providing healthcare for everyone in this country.